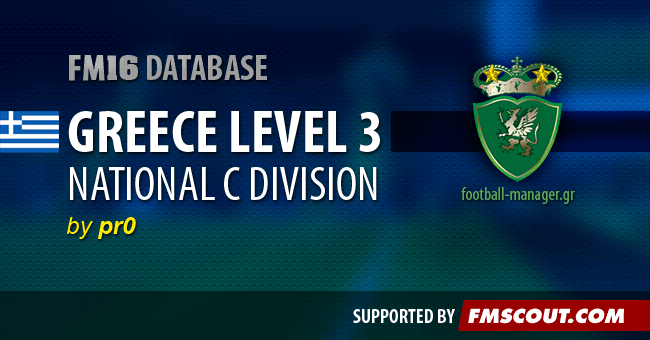 Unlock G' Ethniki, the Greek 3rd division, with this database for Football Manager 2016. Created by pr0. This database will enable you to play within the third tier of Greek football pyramid, known as G' Ethniki / Γ' Εθνική. Created by pr0 on behalf of the football-manager.gr community. National C division made playable with 4 groups. I did NOT add the rule that allows up to 3 players beyond the age of 33 to be used on match day. Extract the downloaded .7z file using 7-zip for Windows or The Unarchiver for Mac OS X. It's also recommended to load all players from Greece using the Advanced... Database Size options. EZJaeger, you have the original game? Do .fmf files not work on a mac? The file does not work despite doing all the steps correctly. When I try to create a new game and choose custom database, it does not show up as an option. Lower leagues are in completelly mess, and there is no chance that I can fix them. Unfortunately.